A themed mini-project in one medium. Due 9 February. The common theme among all the projects will be: “With archaeology we stake our claim to the future by finding our past”. You can choose any medium that we are discussing in this course: photograph, photographic collage, video clip, montage of videoclips, line drawing, audio clip, podcast, videocast etc.. You should elaborate your medium by a textual caption in which you say why you chose this medium and why you think it expresses the theme. For my first medium, I chose photography. When I first posted about the decomissioned street cars in Oakland I hadn’t noticed this yet–it’s the key route symbol for Grand Avenue painted on the fence in my back yard. Someone before me had made the same connection to the place they live, and memorialized it in a semi-private place–the wooden fence that surrounds the yard behind my apartments. The yard was partially why I rented the place; it’s a nice little oasis from the somewhat bleak concrete and asphalt landscape outside my front door. I chose to take a photograph of the back fence during the rainy pre-dawn hours and with a flash, so that it would look as obscured as when I first discovered it, an artifact, a relic, a sign pointing not necessarily to the old key route system, but to a deeper knowledge of Oakland. 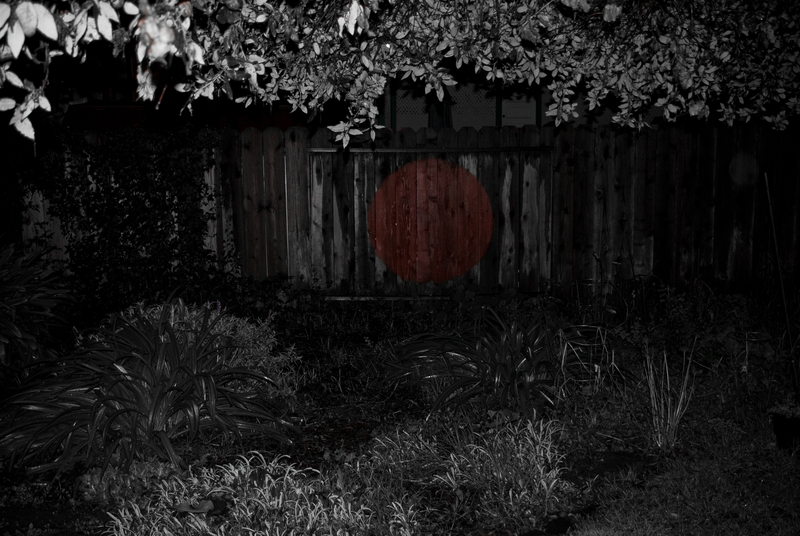 I tweaked the settings in Lightroom so that the red paint was the only color and the rest was desaturated by the dark. Knowing what my apartment, my street, my city looked like in the not-so-distant past is an important part of being an archaeologist to me. It isn’t a profession as much as it is a mode of being, experiencing, seeing–a deep curiosity about the surrounding landscape. This, in my opinion, is the most important thing that archaeologists can share with the future. Quite similar to Chadha’s work with Wheeler’s photographic record are some images by Bade up in our collection. One in particular shows a local Palestinian girl “demonstrating” the use of an ancient saddle quern that was excavated in situ (http://www.fas.harvard.edu/~semitic/HOAI/images/pic-6-1quern-lg.png). Perhaps the connection was not intentional on Dr. Bade’s part, however the image alone, which has gone on to be used in many publications, museum displays, and the web in general, underscores the belief in the unchanging Middle East–that modern peoples in the region could easily stand-in for those long gone because they share a similar technology, clothing, lifestyle. You’re so right! That’s exactly how I have felt for some time. But add to it the potential for a deep interconnectedness with the landscape, be it rural or urban, and with the people of the past, a real sense of continuity and embeddedness. Sounds like a really cool class. There is something definitely fascinating about the relationship between archaeology and photography. I like that statement. It makes me think about when something actually becomes “archaeological”. That’s why the official 45 year designation seems pretty silly sometimes. Maybe with photographs things are instantly archaeological in some way–or maybe they always are. Who knows. Anyway, the class sounds pretty cool. I think there should be more of this kind of thing–in both archaeology and ethnography. Next Next post: Where is Single Context Archaeology?